Accept the Lord of Light! Inspired by the HBO award-winning series Game of Thrones that gives visual life to George R.R. Martin's book series A Song of Ice and Fire, this Game of Thrones Stannis Baratheon Shield Pin features the sigil that Stannis Baratheon took after accepting the Lord of Light, R'hllor, as his God. 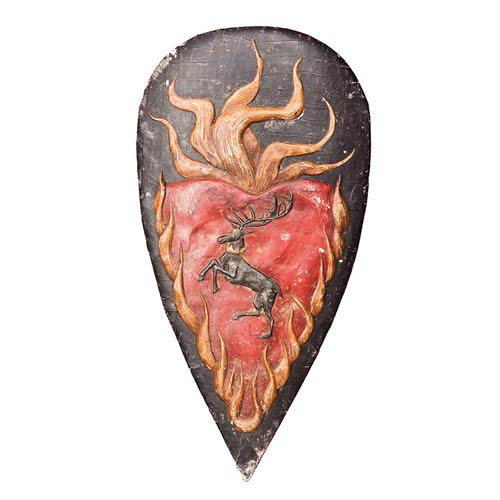 With the Baratheon crowned black stag within a flaming heart, this fantastic pin will show everyone that you too accept the true king's new God! Measures about 2-inches long. Ages 8 and up.